Q: Today, Japanese Prime Minister Shinzo Abe sent a ritual offering to the Yasukuni Shrine spring festival. The Internal Affairs and Communications Minister and over 90 members of parliament visited the Shrine en masse. What is China's comment? A: The Yasukuni Shrine commemorates Class A war criminals of the WWII who are directly responsible for the war of aggression. We consistently oppose such wrong action by Japanese politicians. China urges Japan to adhere to the spirit of the four political documents between China and Japan, earnestly implement the four-point principled consensus between the two sides, face squarely and deeply reflect upon its history of aggression, make a clean break with militarism, and win the trust of its Asian neighbors and the international community. Q: US President Trump yesterday signed a memorandum to investigate whether steel imports from China threatens the national security of the US. Will China take retaliatory measures? A: Just like my response yesterday, we still need to see what kind of investigation it is and what its target is. We cannot make any detailed comments before gathering more information. I can reiterate our consistent stance here. The nature of the China-US economic and trade relations is mutual benefit and win-win results. The past forty years or so showed that the economic and trade relations of such a nature have benefited the two peoples and greatly driven forward the development of the businesses and industries of the two sides. Some of the disputes and frictions arising over this forty years were properly resolved by the two sides through dialogue and consultation under the spirit of mutual respect, equality and mutual benefit. Following the same spirit, China and the US will handle very well disputes that may come up amid future economic and trade cooperation. Q: The Chinese governor of Jakarta, Indonesia lost his re-election yesterday. Will this affect future investments in major projects from China to Indonesia, especially Jakarta? A: This sounds like the domestic affairs of Indonesia. You know that China's policy is that we do not comment on the domestic affairs of other countries. Q: On April 20, the UN Security Council issued a press statement on the failed ballistic missile launch by the DPRK. What is China's comment? A: In fact, I have made clear China's position yesterday. 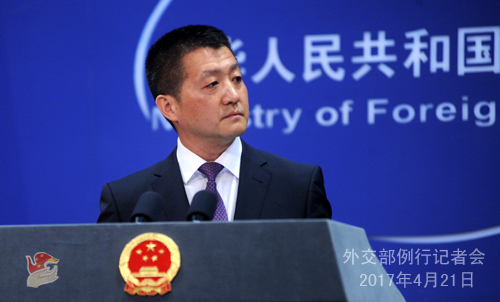 China is committed to realizing denuclearization of the Korean Peninsula, maintaining peace and stability in the Peninsula, and properly resolving the issue through dialogue and consultation. 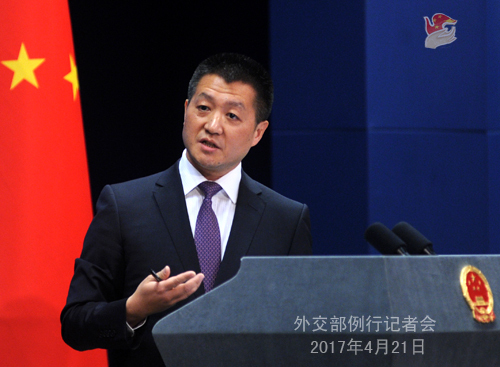 Regarding the resolutions passed by the Security Council on the Korean Peninsula nuclear issue, China maintains that they should be implemented in a comprehensive and balanced way, which means all relevant parties should commit themselves to peacefully resolving the Peninsula issue through dialogue and consultation. We do feel pleased that as a result of the concerted efforts of the Security Council members including China, the Security Council agreed upon a press statement and spoke in unity against the DPRK carrying out launch activities in violation of the resolution. They also reaffirmed the stance of resolving the issue through dialogue. Under the current circumstance, we still believe that all relevant parties should remain restraint and avoid escalating regional tensions. Q: Yesterday, President Trump praised China for unusual moves on the Peninsula nuclear issue. Could you tell us what these moves are? Officials from the US Defense Ministry said a large number of Chinese bomber jets had unusual moves. Do you know what that means? A: I will take your second question first. I haven't heard of that, and I would refer you to the Defense Ministry. Regarding the first question, the Chinese and US presidents had a thorough and in-depth discussion on the Korean Peninsula nuclear issue during their meeting in Mar-a-Lago, Florida. We also briefed you on the relevant situation in time. I still want to reiterate that on the Peninsula nuclear issue, China remains committed to achieving denuclearization of the Korean Peninsula, preserving peace and stability of the Peninsula and properly resolving the relevant issue properly through dialogue and consultation. The international community recognizes the efforts for peace China has made since the on-set of this issue for its proper settlement. We have found that after in-depth communication between the two sides at various levels, including the top-level, the US now has a more comprehensive and accurate understanding of China's policies and stance as well as a better grasp of the efforts China has made. Q: According to the data of on-line vessel-tracking service website, four DRPK coal vessels are docking at Chinese ports. Can you confirm? What is your comment? How will China deal with these vessels? A: I think your question may cover two aspects. As for whether China has stopped importing coal from the DPRK. China's Commerce Ministry and General Administration of Customs released relevant notice on February 18. Since that day, China has stopped this year's import of coal produced in the DPRK as a way to strictly observe our obligations as a UN member state and implement Security Council resolutions. I can assure you that China has been strictly implementing them. As for some later reports claiming that some vessels might dock at Chinese ports, the thing is that if these vessels continue sailing on sea or drifting outside the ports, the crew members will encounter difficulties that warrant our humanitarian help. However, China is serious in implementing the released notice. Never will there be a case when the notice or the Security Council resolutions are violated. Q: The government and the opposition in Venezuela held massive protests these days. Opposition protesters clashed with order-keeping military officers in which three were killed and several hundred injured and arrested. What is China's comment? A: We have noted relevant reports, as well as the Venezuelan government expressing its wish to resume dialogues with the opposition. As a friendly country, China sincerely wish and believe that the Venezuelan people could properly handle their domestic affairs, maintain national stability and economic and social development. This serves the fundamental interests of the Venezuelan people. Q: Philippine military yesterday said that unidentified foreign vessels "harassed" Philippine fishermen in Nanxun Jiao in the South China Sea. The Philippine side is investigating into this. Though they didn't identify which country these vessels belong to, some Philippine media speculated that they are Chinese vessels. Do you have any information on this? Can you confirm it? A: I honestly do not know anything about what you said. You yourself mentioned that the vessels are unidentified, and all sides are in the process of verifying the situation. China also need to check on that. But our position on the South China Sea issue is consistent and clear. We would go on working with the Philippine side to properly deal with relevant maritime issues and create favorable conditions for the sound and steady development of bilateral relations. You may have noticed that since President Duterte's visit last year, bilateral relations have turned around and started to improve apace, with all-around cooperation moving forward steadily. Overall, both sides are able to build upon the consensus of the two leaders and manage maritime issues through negotiations and coordination. Q: India has rejected China's recent move to rename six places in "Arunachal Pradesh", saying that "Arunachal Pradesh" is an integral part of India. India's Foreign Ministry said that inventing names to the towns of neighboring country does not make illegal territorial claims legal. What is your response? A: Since you raised this question again, I can stress again that China holds a consistent and clear position on the eastern section of the China-India boundary. These names are passed down by ethnic minority groups like Menba and Zang who have long been living and working in the region, and they have been calling these places as such for generations. These are objective facts that can be changed in no way. To standardize these names and publish them is a legitimate action as it is China exercising its lawful rights. Q: The Philippine Defense Secretary and the Military Chief of Staff today landed on the Philippine-occupied Zhongye Dao. What is your comment? A: We still need to verify the facts. Like what I just said to another reporter, since President Duterte to China last year, the two sides have been keeping good communication on properly managing and resolving maritime issues. We hope that this momentum can continue. We hope that the Philippines can work with China to jointly maintain regional peace and stability as well as the sound momentum of moving bilateral relations forward. 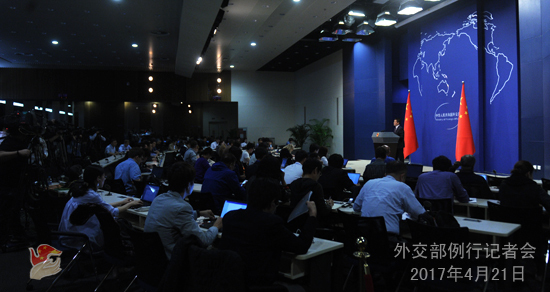 Q: it is reported that the Chinese military may heighten alert because of the DPRK issue. Can you confirm? Relevant reports simply talk about the Chinese military, especially air force, putting on full military readiness, without mentioning specific areas. Of course, this does not mean that China is about to enter into a war state. It may just be preparations for situations that might happen. What is your comment? A: I am not aware of the situation. As I said, I would refer you to the Defense Ministry if you want to know more. Q: There are reports quoting a professor from the Party School of the Central Committee of the CPC as saying that if China were to strengthen its sanctions on the DPRK, it might consider restricting crude oil exports to the DPRK. Is his advice based on China's official information? Will China consider doing as the professor said? A: If you want to know the policy of the Chinese government, you'd better lend your ear to the authorities from the departments of the Chinese governments. Q: Today in Astana, Kazakhstan, Chinese Foreign Minister Wang Yi met with Russian Foreign Minister Lavrov. Can you give us more details about their meeting? It is reported that Foreign Minister Wang Yi will visit Russia. Do you have a specific date for the visit? A: You are right that Foreign Minister Wang Yi, who is in Kazakhstan for an official visit upon invitation and for the SCO Foreign Ministers' Meeting, met with Russian Foreign Minister Lavrov. The press release has been put on our website. You can check on that. I may repeat here that when meeting with Foreign Minister Lavrov, Foreign Minister Wang Yi stressed the importance of maintaining close coordination and cooperation between the two sides on international and regional issues. China-Russia relations are developing with a sound momentum. There have been close high-level exchanges between the two sides. As you may have noticed that Chairman of the NPC Zhang Dejiang just paid a visit to Russia for the 3rd meeting of the cooperation committee formed by the Chinese NPC and the Russian Federation Council during which he met with the Russian leadership. Not too long ago, Vice Premier Zhang Gaoli of the State Council also traveled to Russia for the fourth meeting of the China-Russia Investment Cooperation Committee and the co-chairs' meeting of the China-Russia Energy Cooperation Committee and met with the Russian leadership. We have already released information that Li Zhanshu, member of the Political Bureau of the CPC Central Committee, member of its Secretariat, Director of its General Office will visit Russia next week. Bilateral cooperation in various fields is deepening, which testifies to the high-level performance of the China-Russia Comprehensive Strategic Partnership for Coordination. The major task for the two sides right now is to prepare for President Putin's visit to China next month for the Belt and Road Forum on International Cooperation which will inject new impetus to the development of bilateral relations. The two sides also exchanged views on the Peninsula nuclear issue, agreeing that the development of the Korean Peninsula situation has reached a key stage. The two sides pledged to enhance communication and coordination and work together to manage the situation and prevent it from getting riskier. The two sides also exchanged views on other issues of mutual interest. As for details regarding other visits of Foreign Minister Wang Yi, we will release them in due course. 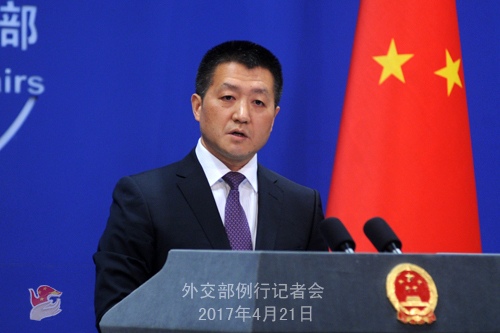 Q: Will China consider rolling out additional sanctions against the DPRK so as to bargain with them? A: We do not respond to hypothetical questions and I also have no further information to offer. In principle, as we keep stressing, the Peninsula nuclear issue must be resolved by addressing both the symptoms and the root causes with a comprehensive set of approaches, and a sustainable solution will be found on the basis of granting proper, balanced and comprehensive considerations to the legitimate concerns of all relevant parties. This move runs counter to the important consensus reached between the two leadership which is to properly deal with the South China Sea issue. Gravely concerned about and dissatisfied with this, China has lodged representations with the Philippine side. We hope that the Philippine side could cherish the hard-won sound momentum of development the bilateral relations are experiencing, faithfully follow the consensus reached between the two leadership, maintain general peace and stability in the South China Sea, and promote the sound and steady development of China-Philippine relations.